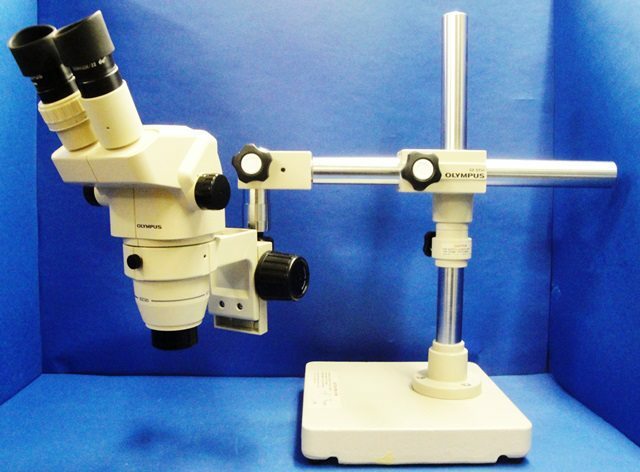 Stereo microscope, binocular, Olympus SZ-3060 with stand SZ-Stu1, heavy stand and transversal / longitudinal arms and prober arm. Zoom from 0.9 to 4x. Eye wide angle GSWH-10x/22. Total magnification from 9x to 40x and respective field of vision diameter 24.4 to 5.5 mm. Working distance of 110 mm. Weight with stand: about 27 kg.